TicHelper is a web-based program designed to assist children and adolescents (8 y/o and up) who are dealing with various manifestations of tics. 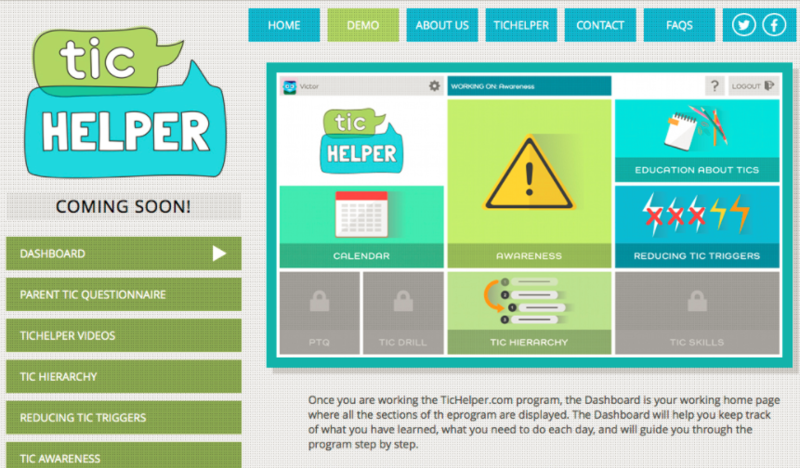 TicHelper is built as an 8-week self-help behavioral intervention. Users are led through the different steps; when one step has been completed, the next step becomes available. The program is comprised of four modules: tic education, reducing tic triggers, tic awareness, and tic blocking. Each module contains a series of short videos with education segments, instructions, demonstrations, personalized tasks, etc. The program is designed for children to use with their parents and therefore some of the content is addressed to the parents. Additional features include a calendar to assist in tracking the user’s progress, worksheets, and a weekly parent questionnaire. TicHelper is suitable, as described, for children dealing with tics and their cooperative parents. The program is user-friendly, simple, and easy. The videos are short, engaging, and professional. However, the program does not offer a clear timeline or structure that enables the user to foresee what is coming and what to expect. Although TicHelper could be used as a standalone program, it could also be incorporated into ongoing therapy, especially in cases where the patient’s tics are not the focus of the therapy (due to prioritization, time limitations, etc. ), but their presence is significant. Provided there is good parent­–child cooperation, the therapist could recommend using TicHelper and offer support when needed through parental guidance.